A South Carolina native, Dr. Floyd graduated from the University of South Carolina School of Medicine and completed his internal medicine residency at Palmetto Health. During his residency, he also pursued a Master’s Degree in Public Health from USC with a focus on occupational health. He followed this education with a preventive medicine residency at the USC Department of Family & Preventive Medicine. 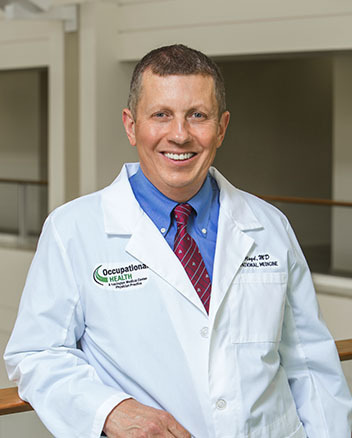 He has practiced in Columbia since 1999 and is board certified in occupational, preventive and internal Medicine. Dr. Floyd’s training and experience have provided him with an extensive understanding of occupational and preventive health. He is highly respected by local businesses for his hard work and partnerships to improve health in the workplace. He is a member of the American College of Occupational and Environmental Medicine and the South Carolina Medical Association, currently serving as chair of its Occupational Medicine Committee.